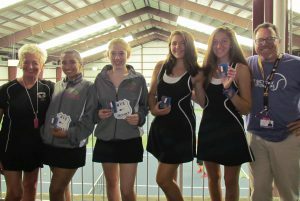 On Wednesday, Oct. 18, Warwick’s wild card, Jacqueline Grundfast and Ava Ghobadian, the OCIAA champs, qualified for the State Tournament. They won their semi-final match and played the Valley Central wild card in the Finals. Uliana Kitar and Stephanie Menoutis, Warwick’s No. 1 doubles team, qualified for the Section 9 as well. They forged ahead to the semi-final round playing against the Valley Central wild card. After a two-hour plus match, they had to play the consolation round against the Cornwall WC. Kitar and Menoutis were the only true No. 1 doubles team to have made it to the final rounds. Warwick’s Coaches Susie Filingeri and William Zwart wish The “G Team” much good luck at the State Tournament, to be held in Latham Oct. 28-31, 2017.